Offering you a complete choice of products which include disulfiram ip- 500mg tablet. 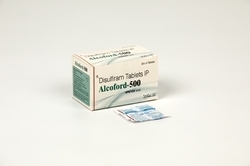 disulfiram is a drug used to support the treatment of chronic alcoholism by producing an acute sensitivity to ethanol( drinking alcohol). drowsiness, tiredness, headache, acne, and metallic/garlic-like taste in the mouth may occur as your body gets used to the medication.